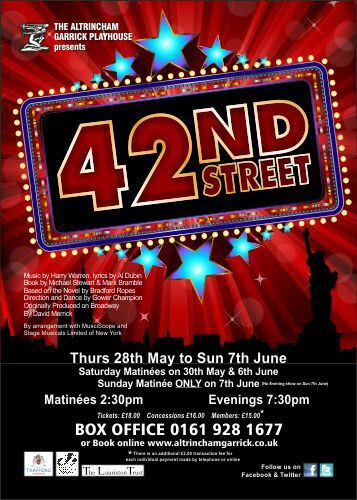 Home» Garrick News » 5 STARS for 42nd Street! 5 STARS for 42nd Street! ’42nd Street‘ ?runs until Sunday 7th June – BOOK NOW! – don’t miss this wonderful finale to our Season! DUE TO TECHNICAL DIFFICULTIES, OUR?MATINEE ON THE ?6th JUNE HAS BEEN CANCELLED ? ALL ?OTHER PERFORMANCES FOR THIS PRODUCTION ARE NOT AFFECTED BY THIS ANNOUNCEMENT.